Some zoos still manage their elephants under systems that permit keepers and animals to share the same space. It is believed that three zoos in the UK – Colchester Zoo, Woburn Safari Park and West Midlands Safari Park currently use this system, generally known as free contact. Free contact places keepers at risk and traditionally relies on the use of an ankus or bullhook (a sturdy stick with a curved, pointed tip). 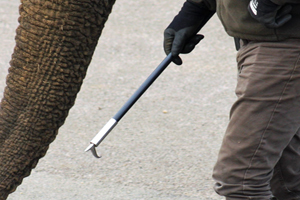 The bullhook is frequently referred to as a guide, yet this method of handling elephants relies on coercion and the reinforcement of painful or aversive stimuli. Free contact handling is acknowledged to be associated with keeper injury and death. We believe that protected contact, where the keeper and the elephant are separated by a barrier, is preferable to free contact. While elephants are in captivity, only positive, reward-based training should be used to allow procedures to be performed co-operatively, such as the examination of body parts and for veterinary procedures. 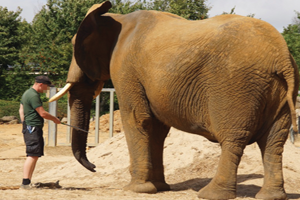 Born Free is calling for an end to the use of the bullhook and measures to make protected contact through safety barriers standard practice across all UK zoos with elephants.